The Crows had their work cut out for them for two and a half quarters against the Blues at Ikon Park. A comeback that began in the third quarter and included seven consecutive goals helped the Crows to notch up the 13-point win. Crows forward Stevie Lee Thompson was influential up forward with four goals. The win was Adelaide’s first win of the season. The Lions came up against a very strong Dockers outfit that had a lot of class all over the ground, especially up forward, where they scored ten goals for the whole match. Due to the immense pressure applied by Fremantle, the Lions struggled to get any momentum after the first quarter as the Dockers took control. The Lions have one win and a loss heading into Round 3 against Melbourne. The Blues played impressive football and were able to get a few goals together against the Crows, but unfortunately they couldn’t sustain the pressure for four quarters and let the Crows come back and win the match. The Blues look like a good side when they’re on and can likely match it with anyone, but they need to be able to match it with sides for four quarters without dropping off their intensity. The Pies struggled all match against the Dees. They only managed to kick only one goal for the whole match, and even that came in the final term. They were outclassed by Melbourne in every contest and had no answers to stop opposition momentum. Collingwood remain without a win from the first two rounds, but things don’t get any easier in Round 3, when they’ll come up against premiership hopefuls the Dockers at the Fremantle Oval. The Dockers flexed their muscles in their dominant 27-point win over the Lions. They were cleaner with possession and smoother with their ball movement. Fremantle kicked ten goals for the match, which can be attributed to the high-quality brand of football they were playing. They are yet to lose a match and do not look like they will lose next round when they play against the hapless Collingwood at home. The Cats fought hard against the Dogs but just couldn’t score the goals when they needed to. The absence of No.1 draft pick Nina Morrison was truly felt in Geelong’s midfield. They let themselves down in the match, as they had lots of inside 50s but couldn’t capitalise on their opportunities. They have one win from two matches, and in Round 3 they’ll have another tough match against the Crows at Adelaide’s Norwood Oval. The Giants were unable to adjust to the bad weather conditions at Drummoyne Oval on Friday night against the North Melbourne Tasmanian Kangaroos. They struggled all match to shift the momentum their way and their kicking inaccuracy at goal did not help. North Melbourne made the most of their opportunities when the football was in their forward 50 but this was the difference, as the Giants could not do the same in their forward 50. GWS are yet to win a match and in Round 3 they will play fellow strugglers the Blues at Blacktown International Sportspark. 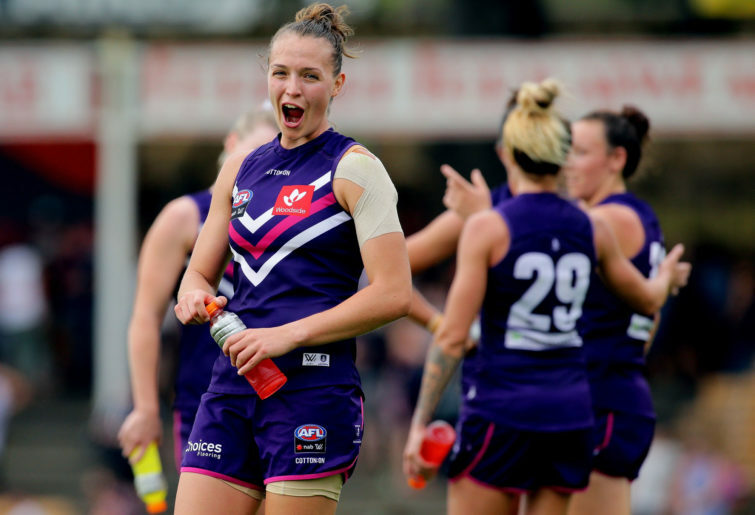 After a narrow defeat in the previous round against the Dockers, the Dees, led by co-captain Elise O’Dea, helped secure the side’s first of the season. Melbourne’s defence was amazing all match, making it hard for Collingwood’s forwards to get a hold of the football. Next round they’ll face the Lions in Brisbane in a match that could go either way as both teams look for a second win. North Melbourne continued to play a dominant brand of football against GWS, just as they did in Round 1 against Carlton. The Giants couldn’t stop the far superior Kangaroos, who played out a 25-point victory. The Tasmanians were able to adjust their skills to the wet conditions and were cleaner than the Giants with their kicking, handballing and marking. North Melbourne now sit comfortably on the top of the Conference A ladder with a healthy percentage. The team’s real challenge will be next round, when they come up against the second-placed Bulldogs, who are also undefeated. The Dogs accuracy in front of goal improved against the Cats at the Whitten Oval, resulting in their second win of the season. Their skills, including disposals and forward entries, were classier than Geelong’s efforts. The Bulldogs are yet to lose a match, but their real test will come next round in their top-of-the-table clash with North Melbourne, which could be a sneak peek at the 2019 AFLW grand final.